Eddie “Doc” Lewis, an iconic New Orleans street trombonist, died August 11. This was a bar full of friends celebrating the birthday of one of their own, and the music sizzled with an emotional intensity born of that intimacy. 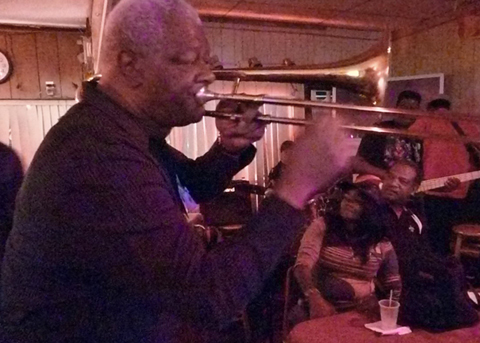 Customers leaned into the musicians to whisper requests; they danced at their tables; they threw their heads back in laughter as Doc Lewis wove this way through the bar playing his trombone in the faces of his loved ones. They traded good-natured banter with the trombonist about how many weeks one properly celebrates a birthday. A bartender recruited several patrons to carry in even more food from a waiting car. Lewis’ party became the opening scene for Part 2 of our series, “Crescent City Blues,” which you can hear here. His banter, as you’ll hear, is hilarious. Thanks to John T. Lewis for letting us know this sad news.